Our wide range of Pet Feeders and Drinkwell® Pet Fountains are designed to ensure your pet is fit, healthy and well provided for by making sure they’re fed the right amount at the right time and by providing a constant, fresh supply of water that’s so vital for their health and wellbeing. A well-watered pet is a healthy pet. Our range of stylish, charcoal-filtered, free-flowing Drinkwell® Pet Fountains encourage dogs, cats and kittens to drink and stay hydrated. Many pets benefit from meals delivered on a ‘little and often’ basis. Our range of Pet Feeders is ideal for all pet cats and dogs. Big cat or small cat? Large, medium or small dog? Cat and dog? 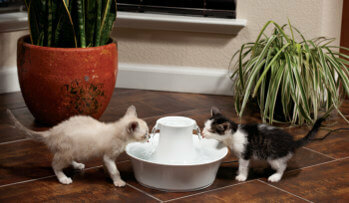 We have a Drinkwell® Pet Fountain to suit you and your pet’s needs. To help you make a decision you should consider the number of pets you have and their sizes. Kitten, cat or dog – a pet feeder helps to ensure a healthy eating regime. Need a digital feeder with 24/7 programming for a medium sized dog? Or perhaps a 48-hour feeder for a cat? 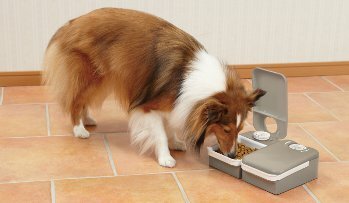 Our Pet Feeders range will have a convenient solution for you and your pet. If you are leaving your pet unattended for a prolonged period of time, then feeding systems are not recommended. Have questions about these products? Wondering how to program a feeder or clean a fountain?